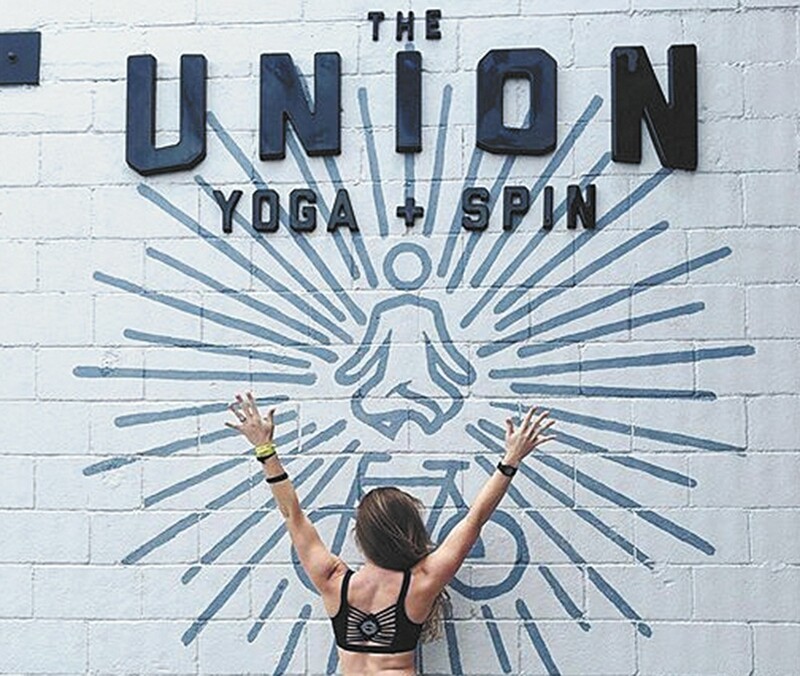 Fun meets yoga at the Union. Walk into the Union's Downtown studio and you'll be greeted with a sweet-smelling aroma, the work of a single grapefruit candle. "People are pretty stinky, so this helps," the front desk attendant says. One of two gym locations, the other in north Spokane, the downtown studio opened in 2014 and paved the way for the second location to open nearly two months ago. Both offer a perfect union of workouts: spin, yoga and TRX; cardio, flexibility and strength. Tennis shoes line the floor outside the workout rooms, and Iggy Azalea's "Black Widow" booms as an instructor can be heard narrating a spin workout. Not even closed doors can contain the energy. "Music is a big vibe for us," says Chretienne Yalung, manager of both locations. "We think it is a huge motivation when you're working out. In a typical class, it has a more outdoorsy feel — you have hill climbs for 30 seconds, and then you hit the pavement. But ours is 'Let's get on the bike, let's play loud music, let's kind of dance and have fun.' It's a different feel. You're working out, but you're having fun." There is also yoga, which follows a Vinyasa flow style in a heated room. There's no need to be intimidated by the astonishing flexibility of the sport's experts; anyone can partake. "We've had GU basketball players, girls who have never done the workout, and breast cancer survivors come in," Yalung says. Though it has the smallest number of participants, TRX — suspension training that uses bodyweight exercises — is blossoming in Spokane. So is the Union itself. Every class offers something new. There are more than 30 instructors on a growing staff, and each formats their own classes and makes their own playlists. "Everyone finds a teacher that they connect with, and that's what we want," Yalung says. On a similar note, special country, rock, and "Selena vs. Bieber"-themed spin classes suggest that fun is to be had, while also resulting in enough sweat to require a potent grapefruit candle at the studio's entrance. What began as unity in workout options is augmented with community and great people. And of course, a killer workout. "Health and fitness is trending right now, but we hope to make it a lifestyle choice, so that people come in and love it and make the decision to translate it into their life," Yalung says.